Ghosts and Phantoms: Do You Know Me? I love to obtain photos of the same person taken either at the same time or even better, at different times. 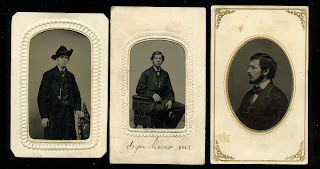 Here are three original tintypes of the same man. The first two appear earlier than the one of him in profile. But what really attracted me to this group of photos is the handwritten note on the middle image that says, 'Do you know me'. 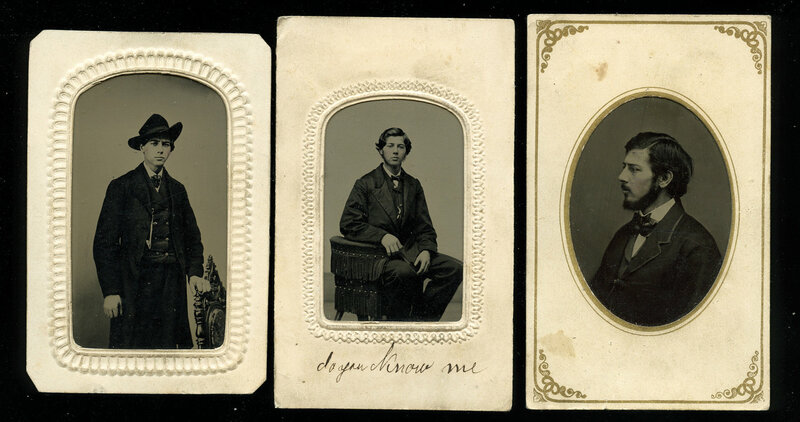 The left image has a photographer's ad on the back: Bon Ton Card/Gem Gallery/J.W. & F.R. Tinsley/2 for 50 cents/Chicago, Illinois. Two are 4" x 2.5"; the other is slightly trimmed.